1) Ian is described as “Superman in a Burton suit” – who would you be? That is such a good question – argh! I would be Bibliogirl in an origami dress. 2) Do you have any recurring dreams? Yes, and they’re both horrible! One involves my teeth falling out and the other involves a school reunion and the sudden realisation that I’m not wearing enough clothes. 3) Have you ever seen a ghost? No (and I don’t believe in them). 4) What’s your favourite sweet? I love Thornton’s Viennese truffles, yum. 5) Who is your favourite Neighbours character? I haven’t watched Neighbours for years. Erm, Libby Kennedy! 6) What’s your most vivid childhood memory? I remember a whole school assembly in which I had to stand up and receive a dressing down for being late for school that morning. I absolutely wasn’t late – my mum was probably the most organised parent in the universe, I don’t think I was ever late for school – and I was only four. By that evening I was covered in hives and my mum was furious. 8) What colour is Tuesday? I didn’t swear for the first 30 years of my life because swearing was a sin, so I’m a late developer. I quite like near-miss swears, like twunt and nucking-futter. I adore twunt, it’s such a satisfying word. 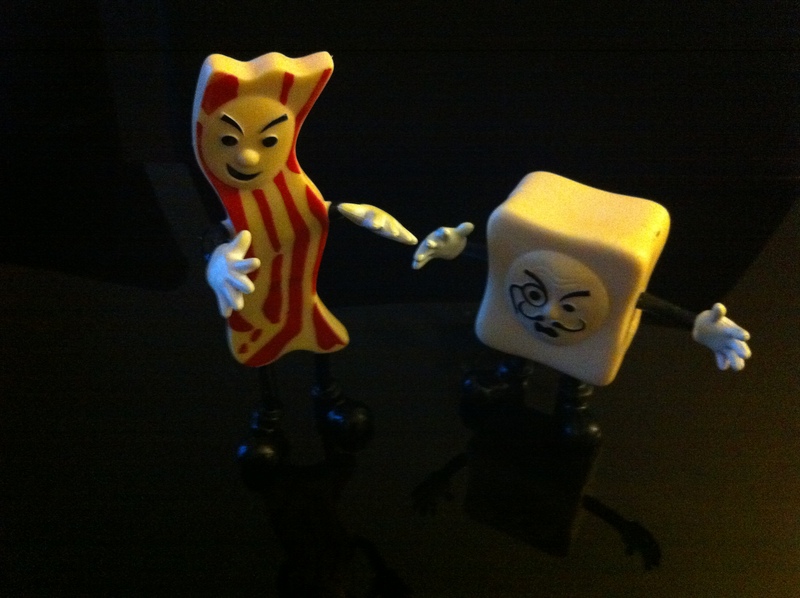 10) Tofu VS Bacon. Who wins? Why? Bacon. The bacony smell is one of the best smells ever. In fact, I think they should make bacon perfume. Carys, they do make bacon perfume – lookit. 11) What is the picture on your wall? 12) What was the last text you sent? A text telling son 3 that no, I couldn’t bring his drum sticks and music book to school because I was on a train to Liverpool. 13) How do you organise your book shelves? I used to organise them by colour but the kids teased me so much that I changed them and now I’ve got short stories in one place and novels/favourite novels, poetry etc. elsewhere. 14) Who would play the character of Claire in the film of your book? Suranne Jones because she’s a great actress, she’s northern and I think she’d be brilliant at the harried/resigned combo. 15) You are wallpaper. What is your pattern? Something flocked in red. My violin teacher used to have this amazing red, velvety wallpaper and I remember stroking it as I waited for my lesson to start. 16) Have you ever read someone else’s diary? Yes. My mum has written in a diary every day since I was born and I sneaked a peek a few times when I was a teenager (I’m pretty sure she returned the favour, so it’s all good). 17) What is your most vivid childhood memory? I think this is a trick question – it’s one of those memory tests to make sure I can remember the vivid childhood memory I described in answer to number 6! 18) What sandwiches would you make for a picnic with Margaret Atwood? 19) What is your Book of the Year? Probably All My Puny Sorrows, which I first read about on your blog! I like the questions you asked. It was a relief not to be asked about novel 2 and Mormonism – thank you! The Bradley family are devout Mormons. Ian is the Bishop, his wife, Claire, converted to the faith before marrying him and together they are bringing up their four children – Alma, Zippy, Jacob and Issy, following stringent Mormon rules. The author was herself, until relatively recently, a practising Mormon, so it’s fair to assume the book is an accurate representation of family life within the faith, with all the accompanying homilies and entreaties. Bishop Bradley is big on sacrifice and duty, believing his path to heaven is assured just so long as he devotes himself to serving his church and spreading the word. He prioritises church duties over family duties, which is why it’s left to an overstretched Claire to shop for Jacob’s birthday party and organise the food. Her youngest, Issy, is unwell and tucked up in bed, Claire too busy to pay her much attention until it’s too late and tragically she dies. Writing about the beach Bray describes, “The track is sandier now, damp and sticky; gritty, like cake mix.” It’s this descriptive power, employing the everyday and and mixing it with insight, which really elevates this novel. The children’s voices all feel accurate – Jacob aged 7: “There are so many kinds of never. There’s the never Mum uses when she says, “Never talk to strangers; it’s dangerous,” and there’s the never Dad uses when he says, “Never play with your food; it’s bad manners.” But Mum talks to plenty of people she doesn’t know, and Jacob has seen Dad break Oreos in half to lick the creamy bit.” These simple contradictions are followed by larger ones. At the centre of it all, the question why Heavenly Father would take Issy. A wonderful debut, full of heart.